Drawing showing the area around Eastling in Kent. This is an 'outline drawing'. It is uncoloured and has no representation of relative relief. Such drawings represented the halfway stage between the original protraction and the finished darwing. 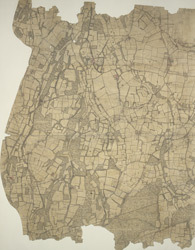 Increasingly sophisticated mapmaking techniques made this intermediate stage redundant by the 1830s. Red lines also feature heavily. Radiating from fixed points, these show the angular measurements taken with a theodolite to enable the surveryor to plot the location of topographical features. Black lines indicate the edges of the area intended to be copied up for the finished drawing.